Monday, May 21, 2012: This is the only photo worth highlighting today. It is a view west-northwest from Hosner Mountain and, as described in the guidebook, overlooks the Fishkill Plains, the Hudson Highlands (first mountains beyond), the Shawangunks (next), and finally the Catskills (tops in the clouds, most easily seen on the right side of the photo). Other than that, I'll let my personal journal description provide the detail of today's episode of "The Trail Goes Ever Onward" and insert a photo or two as time permits. Radar echoes of significance were moving north and could hit as early as noon, so I dressed for a sunrise start to my hiking. I actually was on the trail half an hour after sunrise, at 6AM, headed south on fairly rock free trail over Stormville Mountain, then dropping down to cross Hosner Mountain Road then back up to Hosner Mountain where the trail sidesteps the summit and opts for side-hill walking. It is fairly difficult rocky, up and down trail for the first couple of miles, passing the blue blazed Hosner Loop Trail – blue blazes still prominently visible but with signs at both ends saying the trail was closed in July 2010. The tough walking is partially justified by the reward of a few vista points including the one shown above. 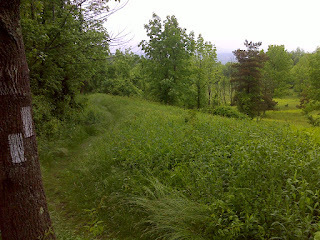 The trail gets easier as it begins to gradually descend toward the Taconic State Parkway. Because they provide variety, I always really enjoy the road walking associated with overpasses or underpasses of major freeways, and this was no exception. South of that underpass the trail drops into a stream valley and crosses another road where the unusual RPH shelter is located – a former house converted to a shelter by tearing out a wall on one side. It’s right by the road and neat as a pin, so obviously must have a near-constant presence of some sort of caretaker. Beyond RPH I made the climb, steep only at first, then in small steps, up to my turn-around point at the very trashy parking area at Long Hill Road. On my return trip through the rough rocky section on Hosner Mountain I could see significant rain approaching. When it hit, it started suddenly and fairly heavily, so there was no debate about pulling out my poncho – get it on as quick as possible. The rain hit right about noon, just exactly as I had projected before leaving this morning. And once it hit it stayed. With just one brief break it rained all the rest of the way back - an hour and a half. I got out of my wet stuff, ate lunch and took a long nap then checked weather again. There appeared to be a brief break in the rain coming, so I prepared, put on my old hiking shoes (comfortable as an old shoe), and headed out a bit after 5:30 PM. 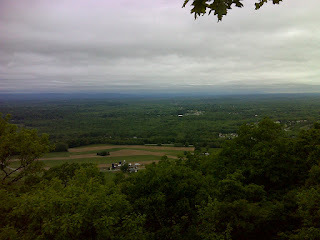 This walk was easy and fun – it featured some open woods walking with little understory, then a field walk that would have had an impressive view to the west if it weren’t for the fog, then a stretch of road walking to cross over I-84. I was finished this short leg by 7PM, having successfully accomplished the minimum miles I had hoped for today despite the rain. Tomorrow looks to be even more soggy, so let's hope I can squeeze in some hiking without getting thoroughly soaked.